Creative people use a lot of tools to get their jobs done, but keyboards and mice are limited in their functionality. Neither are very intuitive, and they can be maddeningly imprecise. 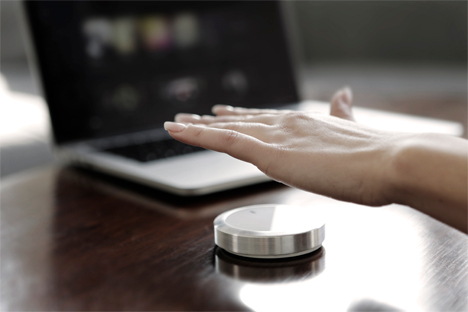 The Senic Flow controller is a wireless, programmable, gesture-controlled tool that can operate all of the tools you use to interact with the digital world. 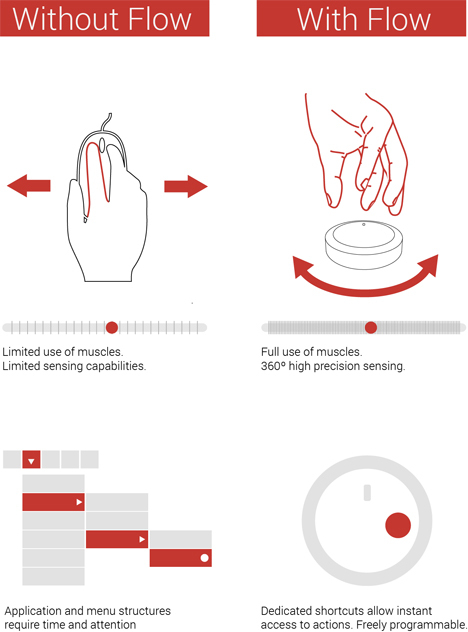 The small round controller operates with three distinct input technologies for ultimate flexibility: hand gesture recognition, touch, and precise haptics. It has a rotating ring around its perimeter that gives you 360 degrees of movement freedom as well as touch-free gesture controls and intuitive touch controls. What you do with these features is entirely up to you because the Flow is completely programmable. The design team’s goal was to create a single controller that would be compatible with all of the most commonly used creative programs. They built in compatibility with Photoshop, Arduino, Youtube, Soundcloud, Spotify, and around 30 more. They are planning to build in even more compatibility, and since Flow is open source, programmers can build in functionality for every program they use. According to Berlin-based Senic, the Flow was meant to be seamless and inconspicuous, fitting into your environment comfortably and easily with a minimum of visual disruption. It’s small enough to slip into a pocket so you can take it with you when you commute between work and home, and its programmed functions can be useful in both environments. The first working prototype of the Flow is compatible with Mac devices; Senic is working on building in compatibility with iOS devices, Android, Linux, and Windows. It connects to your devices via Bluetooth Low Energy, but the company doesn’t say how long a single battery charge lasts. 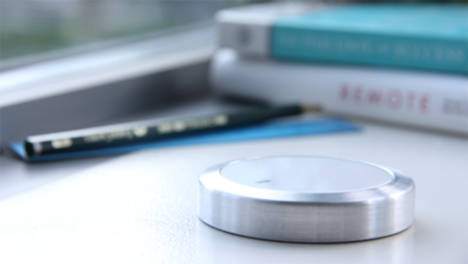 Flow’s IndieGoGo project has sailed past its funding goal and Senic plans to ship the first wave of Flows in summer 2015. See more in Digital Design or under Technology. December, 2014.